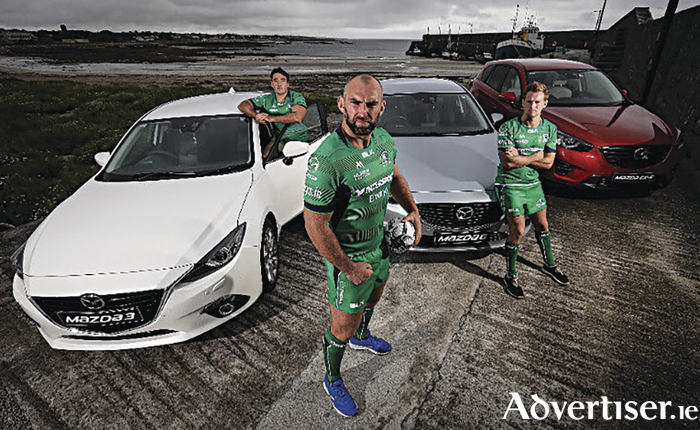 Mazda continue to drive Connacht Rugby. 2016 was yet another strong year for Mazda in Ireland with vehicle sales increasing by 35 per cent in comparison to 2015, also up 25 per cent on the previous year. The Japanese carmaker is thriving in the Irish market with its sales performance exceeding the current motor industry growth which was 16 per cent at the end of 2016. Mazda says its success can be attributed to the award-winning sixth generation product line up which boasts SkyActiv technology and breathtaking Kodo design. Both components, it says, allow the Mazda range to be efficient without compromising on performance, while being arguably the best looking cars on the road. More and more customers are choosing Mazda as an alternative to premium brands thanks to a high quality build and extensive list of options. The fourth generation Mazda MX-5, which was introduced less than 18 months ago, won the highest award of World Car of the Year 2016. This follows a history of accomplishments awarded to the rest of the SkyActiv range. This recognition of the product excellence coupled with the recent network redevelopment have allowed the brand to attain its recent lift in sales growth, making it one of Ireland’s fastest growing automotive brands. 2017 looks to be an even more exciting year for Mazda as two new models will be launched. In February, the new Mazda MX-5 retractable fastback will launch in Ireland. This will give customers a choice of having a mechanical hardtop as well as a powerful 2.0 petrol engine as an alternative to the dynamic 1.5 petrol roadster which was launched last year. Later in the year the new Mazda CX-5 will hit Irish shores. The current Mazda CX-5 has proven to be one of the most successful models launched in Ireland by the brand and the updated version is sure to bring new standards to the competitive SUV segment. The Mazda3 and Mazda6 received updated features in late 2016, including a heated steering wheel, a new premium colour Machine Grey and Mazda’s latest technological advancement; G-Vectoring, which improves driving dynamics, comfort and safety. Customers ordering the upgraded Mazda3 and Mazda6 in 2017 will enjoy this feature as standard. Managing director John Perry says the growth trend for Mazda continues to excel beyond market growth, giving the carmaker confidence for 2017.